I've had this little vintage step ladder at my booth for awhile to use in a pinch. If a piece of furniture sells, it takes up the slack until I can bring in something else. and brought it home for a try out. Here's my inspiration for the ladder display. I thought it was fun for the sunroom. 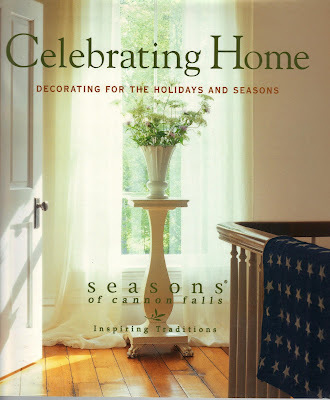 Love those corn husks and old crock jug in the book image. Oooohhh, to have a front porch like this. our old farmhouse had a large front and wrap around porch. Here's the book that I'm having so much fun with! but I've had about 4 "Blackies" in my life. I know... can't say I'm the most original when it comes to names. I just love black cat images. more on the front steps. If you remember, I will be having a monthly give away for the party goers. So one more chance to win by joining in this weekend. Hope you all are having fun decorating for Fall. Hope you'll link up and share what's inspiring you this week! in the passing of my Father-in-law. Great minds must think alike! I was driving home today thinking "how about a ladder on the front porch". Just have to wait til it cools off to buy my mums and pumpkins! With my forgetfulness and this 95 degree weather, they won't last long!! Your porch looks beautiful! Love all the fall touches and colors!! Everything looks wonder-fall! Love your new word. My favorites are the Cinderella pumpkins...where's the Prince? P.S. Thinking of you always! I think your ladder display is every bit as fun as the one with the corn stalks. When I had my retail store Midwest (now Seasons) was one of my main suppliers. Their showrooms were always the most creative and inspiring. Love your pumpkins, watering can, tea trolly - it all looks great. Blessings. i'm sorry I missed that before. ...I like the look of these ladders!! Now I have something else to keep an eye out for ~ right next to a pumpkin topiary! Thank you for this weeks inspiration! I also have a little ladder in my space that if it doesn't sell during this time of the year it will move in. They are fun to decorated with! The ladder really makes a fun display piece. It looks wonderful all dressed up for Halloween. That ladder thing is a great idea! The pumpkins look fabulous on it, too. Call you tomorrow, work almost killed me today. Loving that ladder and all of the fall goodness!! Your new header is adorable, I love how you keep things fresh and alive. Have a wonderful weekend my dear friend. Okay,I feel GUILTY as can be! I HAVE the sitting porch! But mine isn't that "tidy" right now! I LOVE the ladder display! And you may "love you some black cats" and well,,,,I do too, since I have two! But I love those White and Green (????) pumpkins! I've never seen the green ones before! I wonder if I can find them in Washington state???? Too fun! I think I'm going to skip this weeks post as I'm in between SO many projects (Sewing pillows and painting furniture) that I'm not sure WHERE my mind is! Thanks for sharing,,I'll try and get my porch up to "muster" now! All our rain out here isn't too inspirational! Love you to pieces my dear! I am just loving your blog - I always get great ideas. Where did you find the crow? I keep seeing them on blogs and in magazines, but can't find one! We have families of crows all over our property. They are such fun to watch. Hey Debra ~ Another great VF Post. 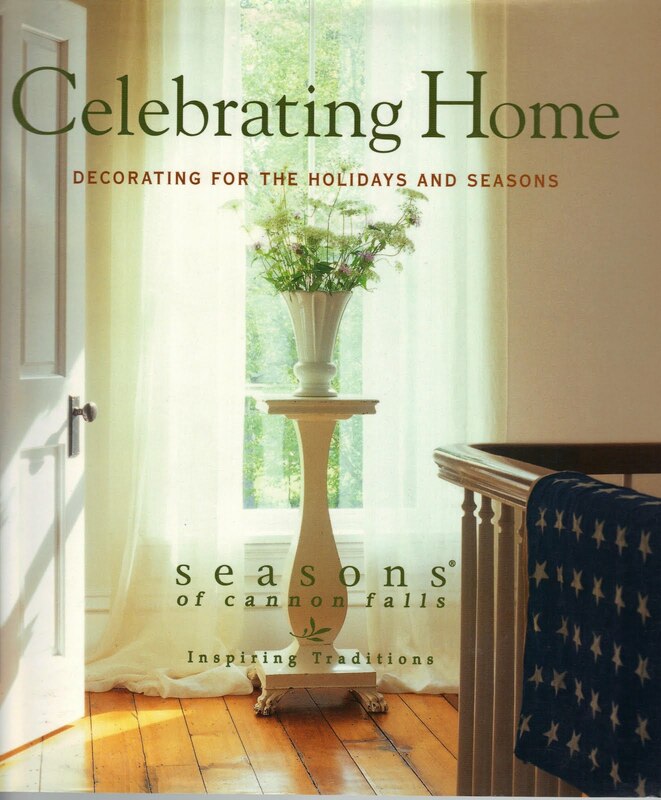 I have that Celebrating Home book as well and just love it. Actually, when my insomnia kicks in ~ this book has saved me on many a sleepless night. I love your sweet crow too ~ we call ours "Basil" (not sure why though:) Happy Friday!!! The ladder is a great way to display! I love black cats too! Hi Debra, Your sunroom looks so pretty all dressed for Fall! I love the little ladder and the basket of fall flowers hung on the wall. I love your fall decorating. Since I live in Florida and it is still in the 90's I just can't get into a fall decorating mode, I see hardly any fall decorating around. When I lived in Minnesota, I use to love fall, I sure miss it! I totally LOVE all your Fall displays. I love this time of year, and need to crave out some time to dig out my Fall stuff and decorate my house. For now, I can enjoy yours! Thanks for sharing. I am so sorry for your family's loss. Please give my best to your husband. Everything looks festive and beautiful as usual. I am joining in again! Bea-u-ti-ful!! LOVE the ladder display and those pumpkins! They are gorgeous!! And black cats! I have one and am partial myself!! I wish I could find some of those fabulous looking pumpkins! I love ladder displays but have never really done one. Yours is so much fun! The use of the painted ladder was brilliant! I'm going to be looking around for one for myself. The pumpkins look just right on it! ANd the little black cat adds a delightful touch of whimsey! Wonderful post. You have a most inspiring blog. And I'm happy I found your party! Now off to visit the party go-ers! It looks so pretty and perfect for fall. I love the little step ladder for decorating. I'm so sorry about the loss of your father-in-law. I'll pray for you and your family. Hi Debra, I'm sorry to hear about your Father in Law. In your trying time I will pray for you and your Husband. I like the ladder idea, this is a great way to display holiday pieces. That ladder vignette/display is perfection Debra :) I think I need one. Yeah, I do. I'm sorry to hear of your FIL's passing...your family will be in our thoughts. Hi Debra! Love your new header and all the wonderful photos today! Have a fun weekend!! great post -love it here. the book is inspirational- I too love the ladder! The ladder is a great idea. I have two really old ones at our warehouse and have asked my husband (oh for about a year now!) to cut them down so I can use them for display. So glad you found some urns. I have been looking for a pretty pair at a resonable price myself. Someone stole mine right off my porch this year. Unbelievable! I think it was kids pulling a prank. I also love the wicker cart you have...so pretty and it's all so comfortable and inviting. Such amazing pumpkins! What a fantastic makeover. You did a wonderful job! Love this! It looks like a magazine Debra. You have amazing talent and it has been so neat to see you open your shop. Just love your style. I have given you a blog award. Please forgive me if you don't participate in these. I'm joining in today, and sure appreciate you hosting this fun event. I LOVE the ladder, Debra! 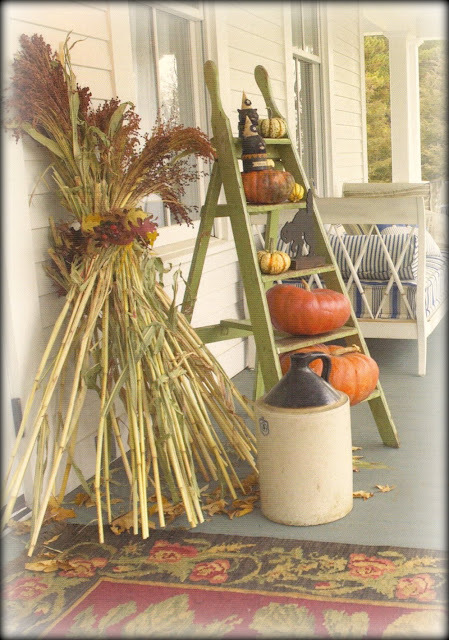 It's a great piece for your porch, and I LOVE your fall displays... beautiful! uuhh I love the white pumpkin with the black birdie on top, -and everything looking great on your wonderfull latter- a beautifull display. I love the little ladder. Don't you just love the way the black pops against all the white. Happy Friday to you. I'm sorry for your loss...prayers are with you! Love your porch and all the decor! Oh Debra, I love your Fall decor! Your porch is such a great space. I always love how you decorate it. I have that awesome book too. It is full of great ideas. I just read of your father-in-law's passing. Sending you big hugs tonight. Love your pics! The ladder is decorated wonderfully! Terrific party!